Fitness apparel providers today carry a world of responsibilities on their shoulders. Considering the fact that fitness goals per se and expectations from the same have changed drastically these days, it has prompted the needs of the century to climb up to yet another dimension. In very simple words, this is the time when owners of retail brands and smaller online / offline entrepreneurs cannot take it easy and serve just about any clothes in the name of fitness apparels to their end customers. Buyers today are enlightened about products and prices, and apply their acquired information when it comes to making purchases. 1. 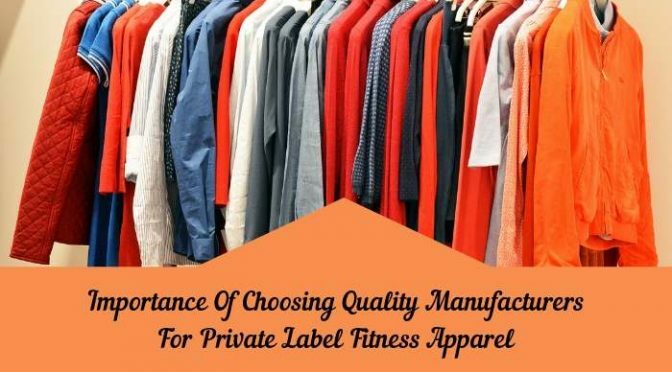 To begin with, renowned and established private label wholesale clothing manufacturers are amply conscious about the diverse fitness routes and associated goals and thus hose options that will be perfectly compatible with each. Retail brand owners and other entrepreneurs can choose according to the demand that is usually placed by their clientele. 2. Secondly, with superior and well chosen private label clothing suppliers, the bulk buyers can be confident about the quality that is promised by the former. Considering the fact that the fabrics and the materials used to manufacture different fitness apparels are different, this advantage is a must to pursue. 3. Thirdly, on choosing the right private clothing manufacturers, bulk buyers can avail good and often unexpected benefits of cost which they can further extend to their end buyers. This advantage can be counted as one of the most potent ways to give the latter a competitive edge over the rest of the private brands that may be operating in the market. Coming across the right wholesaler is usually not very difficult. Many retail brand owners who have been in existence for decades together usually have their own chosen wholesaler to whom they owe their loyalty. These wholesalers may have undergone the processes of evolution to include everything it takes to cater to the needs of the times. For the new sellers in the market, all it takes is a little homework to land with the right wholesalers.